Good acting and beautiful animation could not disguise this transparent attempt at inciting nostalgia and relatability from audiences across the board. Another remake that exists to pad the movie studio’s bottom lines rather than to bring to the world a new take on an old tale. Near the top of the list of remakes nobody asked for lies “The Grinch,” a 3D animated version of the Dr. Seuss’ book “How The Grinch Stole Christmas!” This movie follows the plot of the book and its first two adaptations but only close enough to continue being called an adaptation rather than a spin-off movie. For those unfamiliar with the classic Christmas tale, the basic premise is as follows: The Grinch lives as a recluse with his dog Max, in the mountains surrounding the town of Whoville, a quaint little village meant to give the viewer a sense of nostalgia for simpler times. Christmas celebrations down in Whoville, particularly caroling and Christmas music, upsets the Grinch, who then makes it his mission to steal all of the seasonal decorations and gifts from the Whos in order to stop the holiday from happening. The Grinch accomplishes his mission, but as he sits there on Christmas morning looking over Whoville, he realizes the Whos are still celebrating the holiday. He then understands that the true power of Christmas lies beyond worldly possessions. He goes on to return what he stole and earns his redemption, making his two-sizes-too-small heart grow. That is the standard, out-of-the-box, Grinch story. However, where this most recent movie deviates is where its problems begin. The Grinch is supposed to be bitter and mean, a character that represents the anti-Christmas spirit. Instead, this movie gives us a soft Grinch, voiced by Benedict Cumberbatch, whose first venture down into Whoville is due to his dog needing food. He then proceeds to buy it at “Who Foods” a play on words to the upscale grocery store “Whole Foods [Market].” A character iconic for his anti-capitalist messaging shopping at the cartoon equivalent to one of the most overpriced, class-exclusive stores. Although a small detail, it reflects a larger trend in the movie which is that it was not made to honor the source material but rather to capitalize on hitting as many potential demographics as possible. Beside this, a lot of the jokes seem to play on the self-deprecating and cynical humor of the 2000 live-action adaptation that starred Jim Carrey. In this movie, however, the jokes were often scaled back and tailored to a more sensible audience, which makes them seem misplaced and sometimes had poor timing. Another point of difference between the rest of the Grinch canon and this particular movie is the role of Cindy Lou Who. In the book and the 1966 animated movie, she played a minor role; in the live-action, though, she was the vehicle through which the Grinch’s past and his ultimate redemption were revealed. In “The Grinch,” however, her storyline was significantly more moralistic in nature, resulting in a character that seemed to exist only to remind us that this is still a children’s movie, after all. After forgetting to mail her letter to the North Pole on time, Cindy Lou spends the movie devising a plan to trap Santa in order to get her one true Christmas gift granted — for her stressed and overworked single mother to be happy. While there is nothing fundamentally wrong with her character even as it plays well into the larger theme about the true meaning of Christmas, the execution of her storyline sometimes seems awkward and out of place. 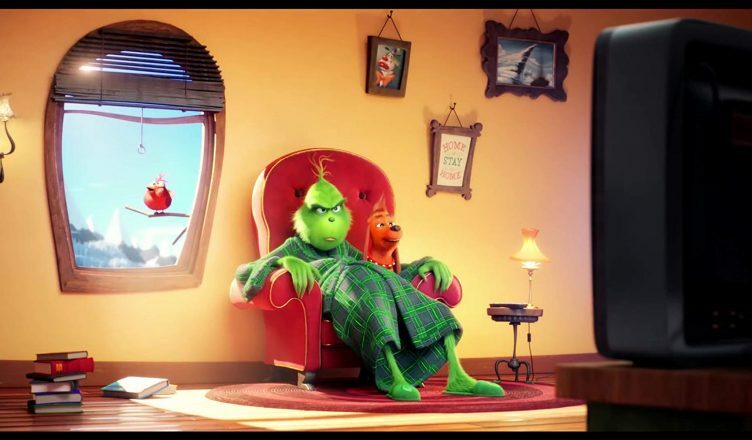 “The Grinch” movie seems intent on pleasing everyone. The 3D animation is cute, the theme song features Tyler, the Creator, one of rap’s biggest names, and the plot has loveable animal companions and jokes about emotional eating — all factors that showcase that the movie was tailor-made to generate money through both box office and merchandising. A true gamut of entertainment meant to capitalize on nostalgia and on parents, the movie exists to remind us that we are all still willing to pay movie theater prices to watch the same story we’ve seen thousands of times before. That being said, this is an adaptation first and foremost, and in that regard, the creative team did a disservice. After the Grinch returns all the presents and Whoville is once again decorated for the holidays, the Grinch gives his dog a gift of a chew-bone. In a movie where the conclusion is supposed to be that material things don’t matter, the protagonist concludes by buying a toy for his dog. The lack of self-awareness in the movie solidifies the point that this movie is an attempt at hitting the correct marketing demographics. In trying to please everyone, it fundamentally diluted the meaning of this holiday classic, leaving audiences to wonder if Christmas really means anything more than the ribbons and tags.